Tart – galette – one crust pie – folded pie. This dish has an identity crisis. Tart is an English term for pastry with fruit, often one serving size, while galette is a French crusty cake with sweet or savory topping. So what to call this delectable dish? Besides a superb ending for a meal? 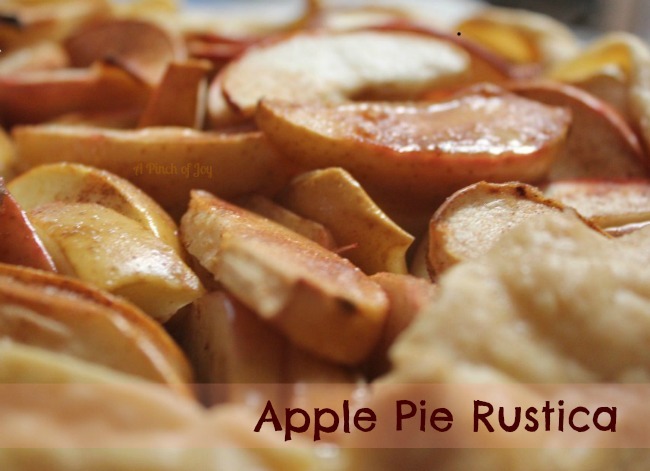 How about Apple Pie Rustica? Rustica as in Italian for simple, without unnecessary embellishment. Not that I know anything about the Italian language! But rustic apple pie sounds like it would have paint flaking off, while ” rustica” sounds solid and to the point! Apples sweetened slightly with a touch of lemon to enhance flavor. Flaky pie crust providing both counterpoint and unifier from the most basic of ingredients. A dish beautiful on its own merits, honest and unadorned. Cooks everywhere have been making this type of dish for centuries – flavorful and quick. First adaption to the 21st century: start with a premade crust. If you have a favorite crust recipe and the inclination, by all means go ahead. But if you are crunched for time, reach for the readymade. I use Gala apples and have discovered that by thinly slicing them, it is not necessary to peel them. Some apples have a “tough” peeling that you are very conscious of having to chew. Not so with Gala – and I know the source for mine so no worries about excessive chemicals. Don’t just dump the apples on the crust, but spread them evenly with your hands. The idea is to form uniform layers 2 or 3 deep so the apples bake evenly. Arranging apples into a single layer flower may be beautiful, but it is certainly optional. I prefer more open fruit on top so plan for just over an inch of crust to fold up and over the fruit. Just enough to hold in any juices released from the apples. You might like more crust and less fruit showing. No one’s judging – just do it! Serve warm. With or without ice cream. Heaven! This recipe was featured at Miz Helen’s Country Cottage. Thank you so much! I am honored! Apples sweetened slightly with a hint of cinnamon and a touch of lemon to enhance flavor, Flaky pie crust underneath. A dish beautiful on its own merits, honest and unadorned. Slice apples thinly. You can peel them or not – whichever you prefer. Place apples in center and distribute evenly, leaving about 1 ½ inch of crust uncovered all the way around the edge. Mix cinnamon, sugar and lemon crystals together and sprinkle evenly over apples. If using lemon juice sprinkle it over the apples first, then the cinnamon sugar mixture. Fold crust up and over apples, pleating as needed to make rough circle. Slice butter thinly and dot over apples. Bake at 350 degrees for 40-45 minutes until crust is golden. Your recipe is featured on Full Plate Thursday’s Thanksgiving Buffet. Hope you are having a great week end and enjoy your new Red Plate! this looks fantastic! Thx for linking up last week, sorry for the delay in visiting but sure glad I didn’t miss this! I love this sort of pie! Apple is my favorite. Thanks for sharing on Crazy Sweet Tuesday! Hmm.. This looks and sounds delicious!! Thanks so much! I am delighted and honored!! This looks like a great recipe, the lemon crystals are a great idea, I will have to try that. My very best wishes to you and your family for a blessed Thanksgiving. Thanks for sharing with Full Plate Thursday and hope to see you again real soon! Thanks for stopping by — and for the invitation! Charlene, this is perfect for a time-crunched cook over the holidays! Simple goodness. I’d like to invite you to share this at my party! Hope you can come.